Imagine that you just bought a new condo and, since you care about saving the planet while saving yourself money, you’re also thinking about buying a new electric vehicle (EV). You check your new parking lot for an electrical outlet, only to find that there isn’t one. With persistence, you ask the property owner about installing an EV charging station in the parking lot for communal use, but after reviewing the building plans together, you discover that the property does not have the electrical capacity and pre-wiring infrastructure (such as conduit) to support an easy and low-cost installation. You’re concerned that without access to home-charging, you won’t have a place to charge your new EV, and so you surrender and buy another gas-powered car. This exact scenario is one of the major challenges for many consumers thinking about buying an EV, but it is solvable, and has been overcome by several communities across the Southwest with “EV-ready building codes”. What Are EV-Ready Building Codes? EV-ready building codes are one of the most effective and low-cost strategies for states and local governments to encourage consumers to buy or lease electric vehicles. 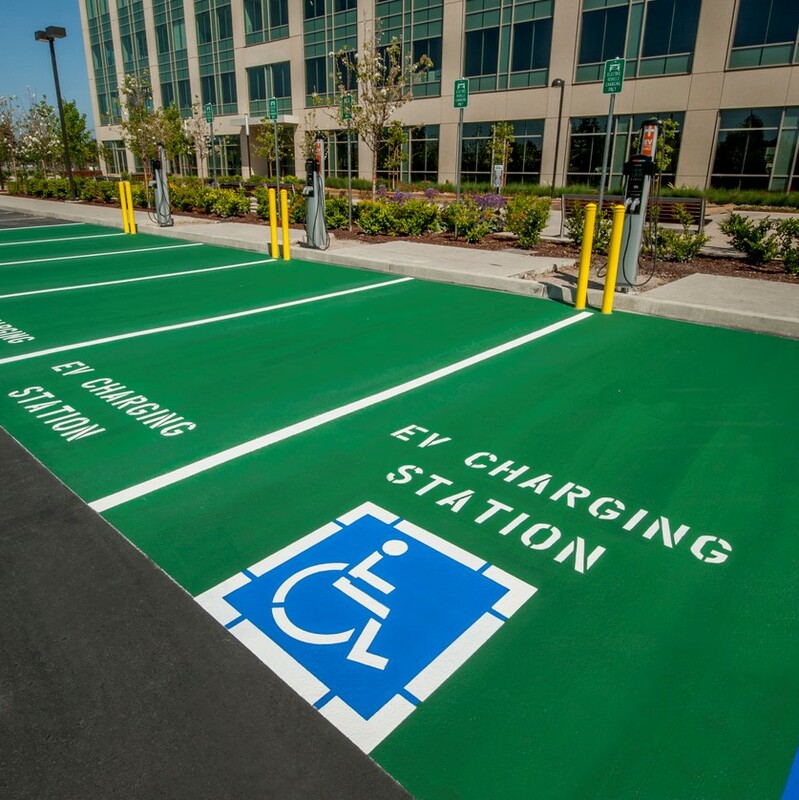 At their most basic, the codes establish EV infrastructure requirements for new construction projects, including the electrical capacity and pre-wiring to make possible the future installation of EV charging stations. States and municipalities around the country have developed their own EV-ready building codes to accommodate local EV market trends and to meet community-specific climate goals. To make sense of existing codes and simplify the options for your community, SWEEP has created an understandable short EV-Ready Building Code Primer, covering residential and commercial building codes and samples of municipal ordinances. Why Do We Need EV-Ready Building Codes? The U.S. electric vehicle market is accelerating rapidly with 52 straight months of year-over-year sales growth. Over the first nine months of 2018, the EV market grew 70 percent compared to the same period in 2017. Encouraged by these trends, Colorado Governor John Hickenlooper announced a state EV goal of getting 940,000 EVs on the road by 2030, a significant increase from the 15,000 EVs on Colorado’s roads today. And every governor in the Southwest has signed the REV West MOU, which commits the state to a number of actions including “Identify and develop opportunities to incorporate EV charging station infrastructure into planning and development processes, such as building codes, metering policies, and renewable energy generation projects.” To support the monumental transition from gas-powered to electric vehicles, communities across the Southwest will have to install millions of EV charging stations in both the private and public domains. Approximately half of all vehicles in the U.S. belong to residents of single-family or duplex homes with access to a dedicated off-street parking space, such as a garage or driveway, which could be used for overnight EV charging. These new homes are built to last for decades, so they should be ready to accommodate emerging technologies, including the capacity to charge electric vehicles. The other half of vehicles today do not have reliable access to a dedicated off-street parking space at an owned residence, so the EV market needs to move beyond single-family detached homes and expand charging access to multi-family unit dwellings, workplaces, and commercial properties. EV-ready building codes support this expansion and can save consumers thousands in installation costs. Studies have shown that EV-ready charging infrastructure is significantly less expensive to install during new construction than it is for a building retrofit. 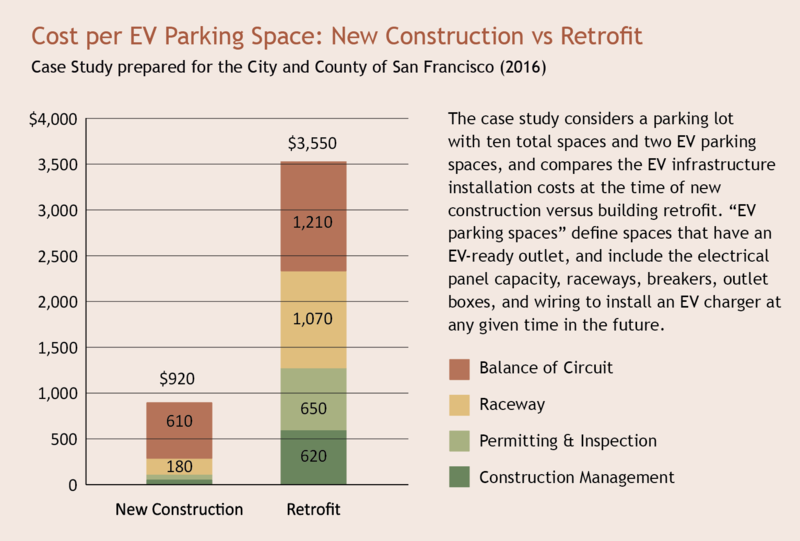 For a parking lot with 10 total spaces and two charging stations, the estimated EV infrastructure costs amount to $920 per charger during new construction, versus $3,710 per charger for a retrofit, largely because of trenching, demolition, and additional permitting costs. What Are The EV-Ready Code Options? State and local governments around the country have led the way on EV-ready building codes, with requirements that have been adapted to best fit the needs of each community. Three basic options for EV infrastructure requirements are detailed below. For one- and two-family dwellings with dedicated off-street parking, EV-capable or EVSE-ready outlet provisions are required for at least one parking space per residence. For multi-family dwellings and commercial properties, EV infrastructure requirements are applied as a percentage of total parking spaces (e.g. 5 percent of total parking spaces are to be EV-capable for parking lots with over 10 parking spaces). Where Do They Belong in the Building Code? EV-ready code language is often introduced as a part of the municipal building code amendment process, which typically takes place every three to six years. The International Residential Code, or IRC, applies to new one- and two-family residential projects with access to an off-street parking space in a garage or driveway. 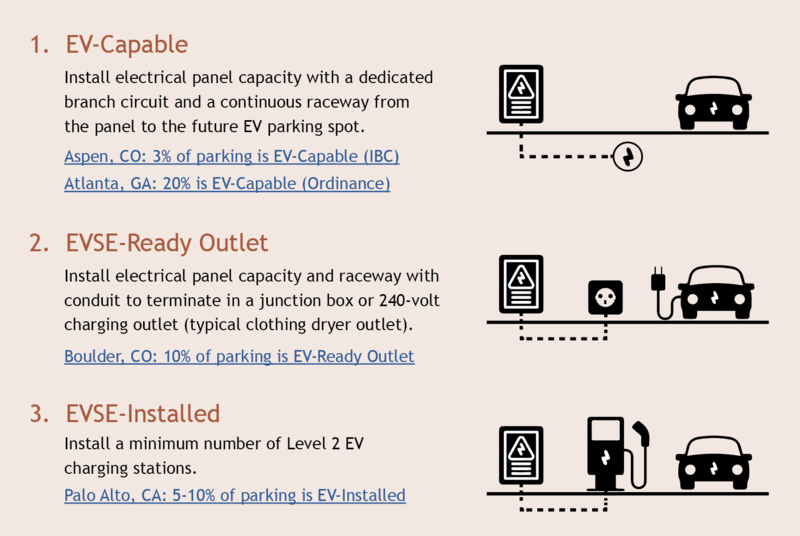 The majority of IRC EV-ready building code amendments call for EV-capable infrastructure, but some cities, such as Boulder County, CO, have chosen to require an EVSE-ready outlet. New multi-family residential and commercial construction projects must comply with the most current version of the International Building Code, or IBC. These code requirements typically apply an EV-capable percentage to the total number of parking spaces. The more progressive IBC amendments, such as the one in Palo Alto, CA, require 5 percent of new parking spaces to have an installed Level 2 EV charging station. An alternative to the building code amendment process is to pass an ordinance, which can be proposed at any time and considered for approval by a city council or county commissioners. Whereas building codes define the technical details for new construction projects, ordinances govern the use of property by land use and occupancy type. With an EV-ready ordinance, municipalities can vary the percentage of EV-charging spaces by type of occupancy (business, hotel, hospital, golf course, etc.). A number of states, municipalities, and community improvement districts in the Southwest and across the country have introduced EV-ready building codes for new construction over the last decade, including Denver, Boulder, Boulder County, and Aspen in Colorado. Review a full list of codes here. By adopting EV-ready building codes, other communities nationwide can prepare their new housing, commercial buildings, and public event centers for transportation’s emerging future. Matt Frommer is SWEEP’s Transportation Program Senior Associate, where he focuses on electric vehicle policy and EV-grid integration.